Montblanc Pen and Writing: What to do Without Electricity? Imagine a time you needed a pen. Let’s say, it was a Mont Blanc fountain pen, any of them. Why would you need it? When you want your handwritten correspondence to have a distinguished look a digital medium is often insufficient. Note-taking, writing, it’s a lost art form in these modern times. What used to be a laborious but rewarding process has supposedly been sped up and made more efficient using keyboards, tablets, voice-recognition software, the list goes on. Let me posit a question… what’s your solution when lightning strikes, and your technological construct is cut short? Batteries only last for so long. You can go with a regular old pen from a box of 100, or you can make every word and pen stroke count with a unique Montblanc Pen. One of, if not THE premium brand available at Executive Essentials (an authorized Mont Blanc Fountain Pen dealer), you would be hard-pressed to find anything to match the experience of writing with the best in the business. Once you feel how smooth and easy the ink flows from pen to paper, it’s hard to imagine even typing again. Believe me; it was tough to get back to this keyboard. 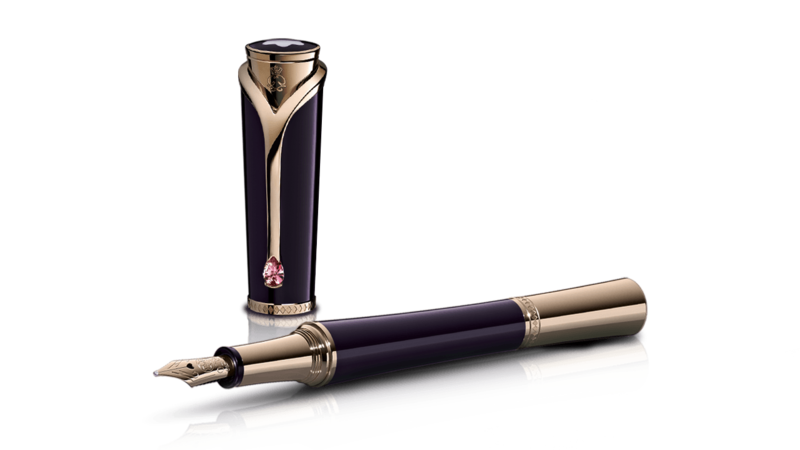 With such choices inspired by Alfred Hitchcock, Johannes Brahms, and even Princesse Grace de Monaco, you can’t help but feel something special connecting you to the creative power of those luminaries, especially in the Montblanc Special Edition Pens. Executive Essentials carries Montblanc Limited Edition Pens as well, offering not only a tactile feeling of writing unmatched in any other pen, but a look you can’t skin onto a tablet or smart phone, but only while supplies last. There are many times in your life that you get what you give, and a Mont Blanc fountain pen gives plenty, Limited Edition or not. Your distinct handwriting, your distinct look, heck a distinguished look, and all because of a pen you went the extra mile to own something that isn’t just worth a thousand words but will elegantly write that many as well, if not many more. Author ReneePosted on July 11, 2017 Categories Limited Edition Pens, Mont Blanc, PensTags Fountain Pens, Limited Edition, Limited Edition Pens, Montblanc, Montblanc Pens, PensLeave a comment on Montblanc Pen and Writing: What to do Without Electricity? Pens are for writers or so we are told. At the very least, we are lead to believe that pens are for people who have something to write about, regardless of whether it is writing in the academic sense of the word or just writing a note to your downstairs neighbor reminding him that leaving his garbage out on Monday, when pickup is on Thursday is only a boon for the neighborhood dogs and not a good idea for the neighborhood in general. Fine writing instruments are for those rare souls who have the wherewithal to turn language into something more than a means to purchase a cheeseburger in a fast food drive through. They are for thinkers and doers of all sorts, great and small. They are for people who not only relish the use of words but relish the look of words, the handwriting, the contrast of ink on paper and the feel of a weighted instrument balanced delicately in the hand while penning a thought or wielded violently with force while making a point. But, sometimes pens are picked from the pile and forced into service under many different conditions than that of telling stories to be read by the masses. Sometimes they are put into use to explain rather than to tell. To show rather than to entertain. Sometimes a pen is engaged in order to aid the mind in endeavors new and unknown. Such is the case of a pen’s life when wielded by a scientist. And such is the case of the pens in the hands of Albert Einstein. Born in 1879, the man who would largely become instantly recognizable for his frock of shocked, white hair would become one of the world’s greatest scientists. He was German-born, pressing his mind into the areas of theoretical physics which would lead him to develop the general theory of relativity. Although this theory would later become a large part of modern physics, he becomes best known for his equation E = mc2, which outlined the relationship between energy and mass. Continuing on his amazing career, Einstein garnered a Nobel Peace Prize in physics for his work in theoretical applications in 1921. Specifically, he was awarded the prize for his discovery of the photoelectric effect, which became the key piece in understanding quantum theory, which explains the fundamental properties of matter. Something that all scientists would like to understand. It’s clear that someone as thoughtful and engaged in the world around him as Einstein would spend a lot of time at his desk, pen in hand. And he did. 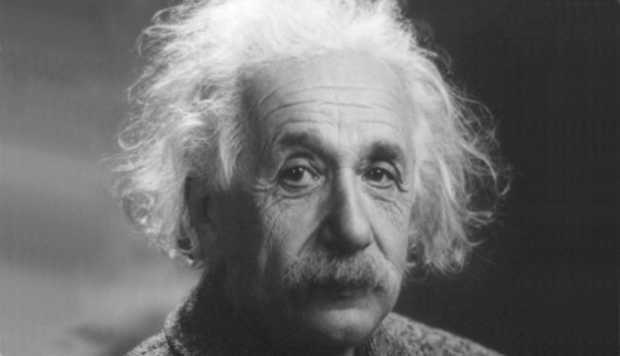 By the time his life came to an end in 1955, not only had Einstein played a large role in the development of atomic weapons, but he also wrote over 300 scientific papers and penned about 150 non-scientific ones as well. 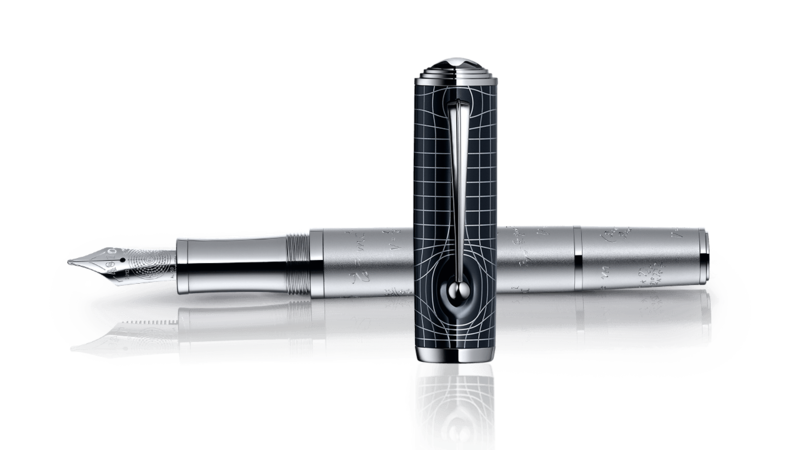 To honor this great scientific mind, Montblanc has put their best designers to work in order to come up with the Montblanc Albert Einstein – Great Characters Limited Edition Fountain Pen. This pen pays tribute to Albert Einstein with the Great Characters Edition 2013 pen. Only 3,000 fountain pens in this design will be made. Each pen has a solid gold nib, enhanced with an engraving of the chemical element ‘Einsteinium’. In addition, the barrel has filigree engravings to reflect the formulas that Einstein was best known for, including the famous E = mc2. Take the time to look at this great tribute pen by Montblanc and don’t forget to look at other great pens in the Executive Essentials catalog.